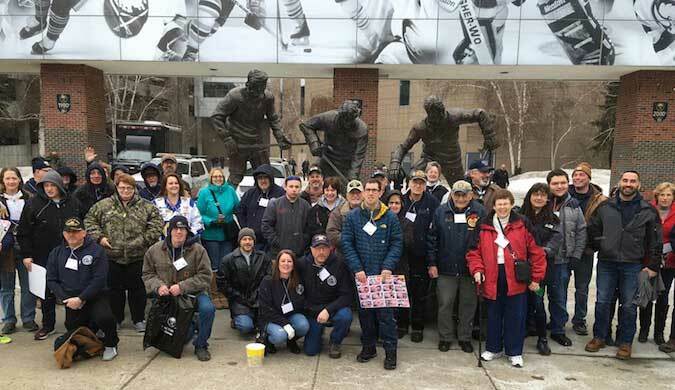 BUFFALO – This group of veterans and their families from Orleans County are pictured outside the KeyBank Arena on Saturday when they attended a Buffalo Sabres game (a 3-1 win over the Detroit Red Wings). A group of 54 attended the game through the Orleans County PFC. Joseph P. Dwyer Peer to Peer Volunteer Program, which aims to provide social opportunities for veterans and their families. Most of the people in the group took a bus to the game. Catherine Schmidt, program coordinator, said more events are planned to bring veterans and their families together. This photo was taken outside the KeyBank Arena with the bronze statues of “The French Connection”— Rick Martin, Gilbert Perreault and Rene Robert. The French Connection accounted for 1,116 goals and 2,573 points in 2,396 games together. They were a dominant force during the 1970s.